When you want a real chance that a big blogger shares your content, you have to make sure that your content is worth it. That sounds harder than it needs to be. Brian Dean from Backlinko has written a lot about this step, how he and his readers used it and the amazing results they got with his skyscraper technique. I adapted his technique, creating a type of content that had the sharing aspect build in. 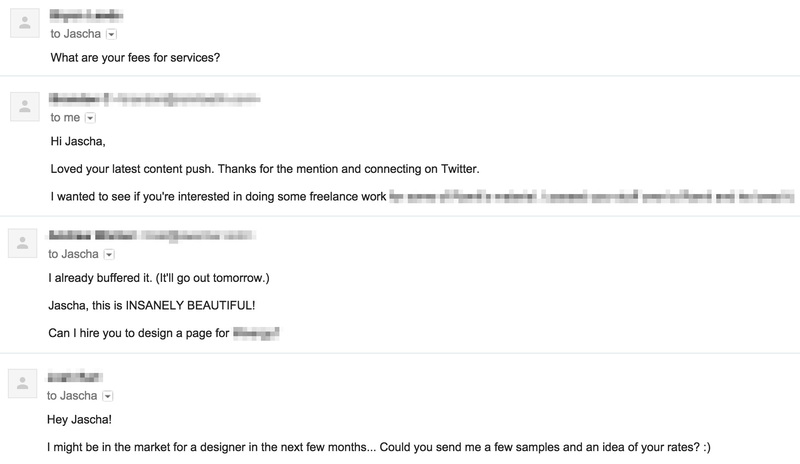 And I made sure that it is about a topic where I already had immediately enough influencers in mind that would be interested in it. Choose a topic you already are intersted in and know something about. Then research the single best tip or technique a specific expert in that nieche is known for. Gather all of these tips, techniques and strategies in one single in depth article. Eighty percent of the content was already in my mind as I had followed that specific topic and these influencers for months. I just needed to write it down and research them a bit more. Why does this work so well? Because you are actually helping these influencers. You reinforce their expert status, mentioning them inline with dozen of other experts about the same topic. You do the wingman, giving them even more credibility by talking great about them. You help making them known for their specific technique. Mind that this is not a roundup post. You have to take the content from these influencers and put your own spin on it, enhancing it in every possible way and create a really great piece of content. Even big magazines do that all the time because they know it works. Our health and nutrition blog got dozens of times mentioned by big magazines like Elle or Womans Health. Along with a dozen of others “nutricion experts” that were as well happy to share it with their readers. If you decide for the expert roundup post type, this should be quite easily. You already have done most of the work by creating the content and mentioning experts with their specific advice on a single topic. But you can go further. Who else could have an interest in sharing your content? Who else have talked about the topic before? Who else is selling a related product? Can you include some examples of persons using it? You can use it as well to find the right influencers for your content. Use buzzsumo.com to find related articles and look which big influencer has shared them. (They have a free 14-day trial account). Create a spreadsheet where you include their Name, their Twitter Account and their Email Address. You will learn in the next step how to find their real contact information easily, fast and reliable. Your List doesn’t have to be very long. I had arround 30 influencer targeted but just wrote to 16 of them directly. The key is to target the right ones. Quality over quanity. If you get just a handful of them to share your content you will already get great results. Step 3: Find The Email Of Almost Any Influencer. Fast. Once you prepared your list, you need to search for their email address. There are a lot of posts already out there that explain you how to do it with browser plugins or a google spreadsheet. But I accidentially found a pretty straight forward way that is a lot faster and reliable then the existing ones. Go to Allmytweets.com, signin with your twitter account and then enter the twitter handle of evey single Influencer. 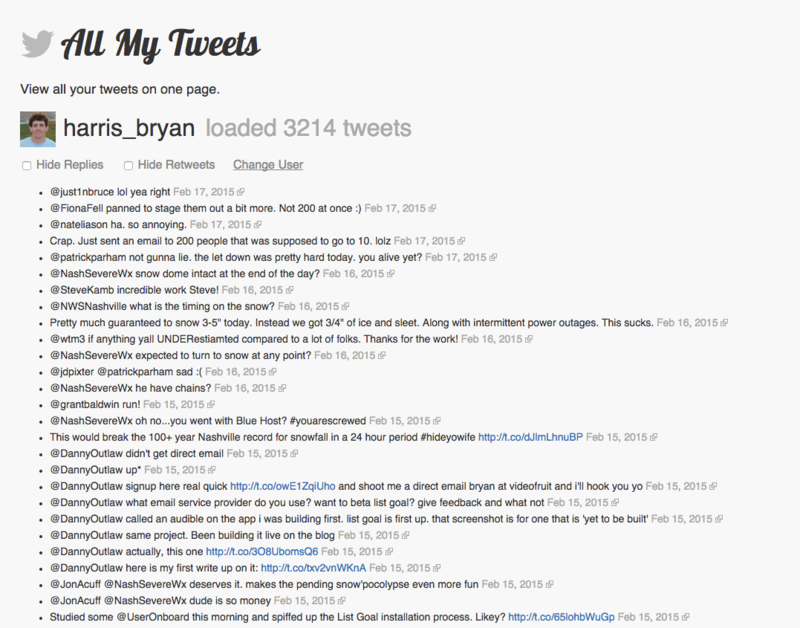 Wait a few seconds until the maximum of tweets are loaded (~ arround 3000). Then start searching simply for “email”. 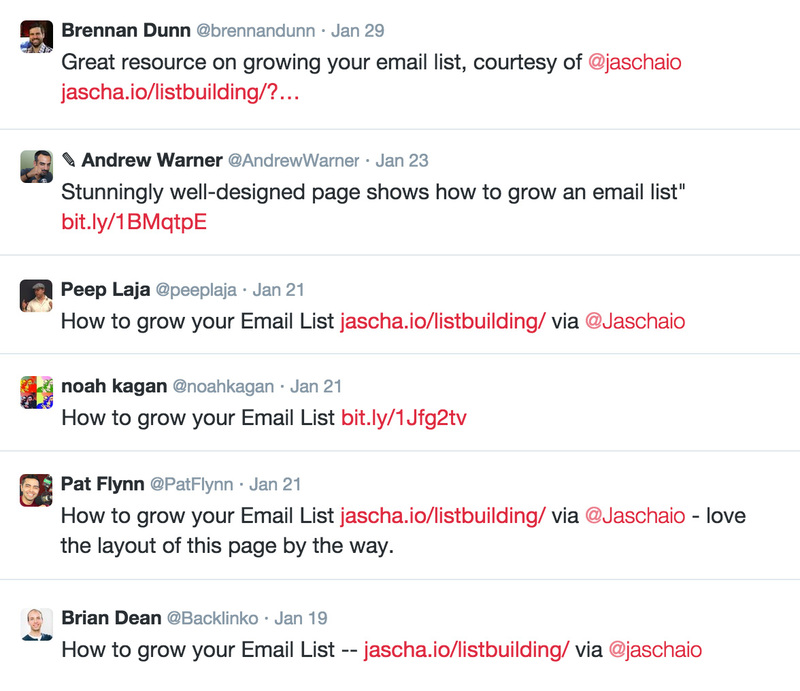 You will be suprised how easily it is to find the email of almost anyone who is active on twitter. Make sure that you are following everyone on your list. We don’t just need this for the next step, but its overall a good idea. You will naturally find chances to connect with them over time responding to a tweet or helping out. The biggest problem when we try to outreach to big bloggers is, that we can’t just use our name or our blog to open the doors. But there is a pretty neat trick you can use to overcome this problem. Concentrate your first outreach on just one single influencer. Maybe its one you had previously a little connection too. A replied tweet or a comment that they have noticed in the last few days could be enough. You can as well choose the one you are following the longest time, so you feel more comfortable to ask for something. Or its the one with the highest probability to answer your request. The topic was relevant to him and to his readers. And we already made sure as the very first step that our Content Piece is worth to share. It depends on the person you are targeting if its better to send a tweet or to do it via email. A basic rule: If they are really active on twitter, e.g. actively engaging with tweets and replies then you should do it directly over there. If you got one influencer to share your content everything gets a lot easier. You now can borrow his credibility and connections for your own outreach. In case of Brian Dean I just checked who else on my list is following him. 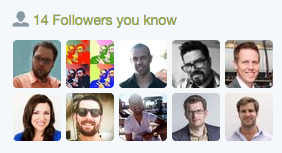 Twitter has the function build in, right below the profile pictures in the section “Followers you know”. Thats why its important that you follow everyone on your influencer list. These were the logicaly next persons on my list I needed to approach. Think about it, most people take five minutes to write their emails. They don’t care if its not clear what they want to say. They don’t care if the receiver instantly notice that they don’t care about his time. They don’t even care about whats in it for him. Its obvious why they don’t get results. Than they take that cheap rapidly written email and blast it out to a huge list of 5000 people. It took me two to three hours to write the first version of the outreach email. This maybe sounds like a lot of time for a simple email, but it shouldn’t be just that: A simple email. Thankfully you don’t have to spend so much time as you can just download my checklist that will make it a lot easier for you. Even big bloggers don’t want to be the first ones. 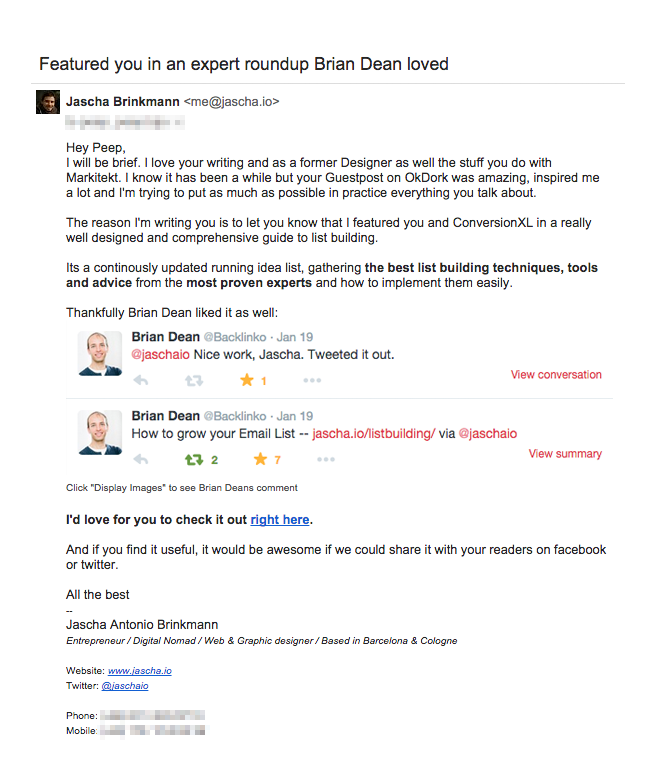 So I used a screenshot of Brian Dean tweeting about it as a social proof. And I used his name directly in the subject to borrow his credibility. After I got a few more Influencers to tweet about it, I then continued to use their names and screenshot of their tweets to reach even more experts in my list. Everytime dropping in a name of someone I knew they already respected. This approach worked really well for me. I got a 80% response rate and half of them actually shared it over twitter. I got over 2000 visitors. 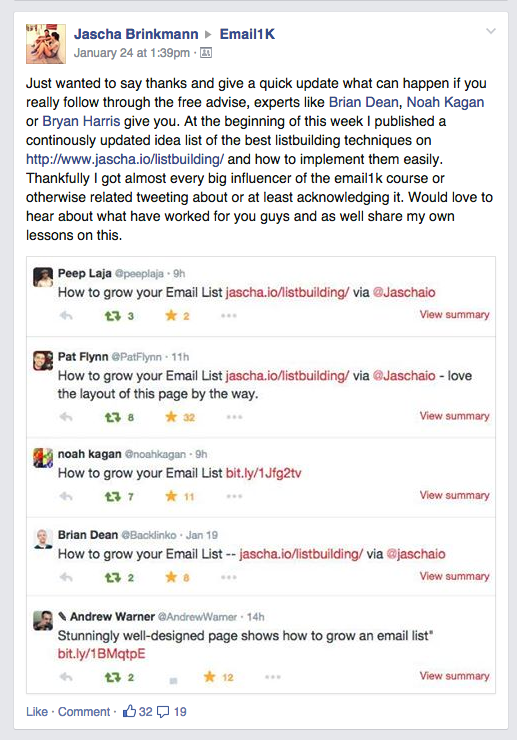 Build my email list from zero to the first 100 subscribers in just a couple of days. And even more important I earned a lot of new connections and consulting opportunities that were worth more than 20,000$. Think what a great outreach campaign could do for your Blog Business. If you are part of some facebook group you will see that a lot of people try to use the group to promote their content. But even if its valuable content this approach fails miserably most of the time. You need something interesting to say. You need a story to tell. If you follow these steps and get results in your nieche or industry you can then go ahead and use this enormous social proof to promote your content further. I didn’t just shared my content, but used it as a chance to connect with other members of the group and to add value to the conversation. They are not easy because you have to do the work. And you have to overcome your fear of rejection. It cost me quite some time to send every single one of these emails. But its when we take action that real magic can happen. If you do the work and overcome your fears you will get results. 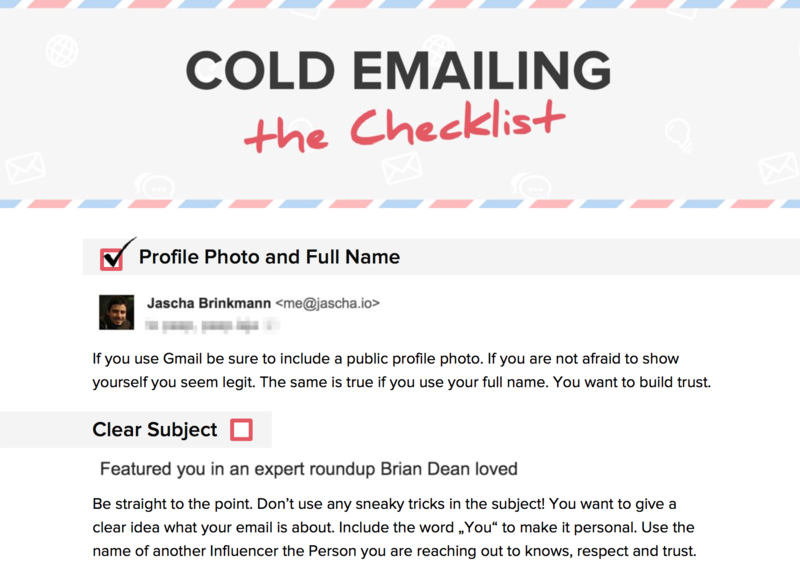 To make it easier for you to get started be sure to download my checklist that helps you writing your cold email right here.